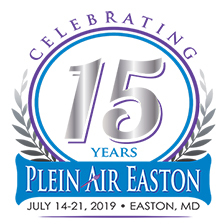 Become a Friend of Plein Air Easton! The Friends of Plein Air Easton are a group of active supporters who ensure that Plein Air Easton exists and thrives into the future. Plein Air Easton is not a single event or moment but a series of meaningful experiences where opportunities to engage, learn and explore the Eastern Shore's stunning geography, art and culture abound. Friends have the opportunity to attend the Meet the Artists Party and be a part of a unique art experience reminiscent of gilded age paint outs on the great estates of that time. Attendees are encouraged to walk the grounds of the property and watch the 58 competing artists capture the moment on canvas. It is also an opportunity to take note of whose artwork to watch throughout the week. The day's work will then assembled for show & sale, followed by a lavish dinner under the stars shared by the competing artists and art patrons alike. This year’s Meet the Artist Party will be held on July 14th at the home of Wayne Hockmeyer, Kirby’s Wharf Farm. Originally patented in the mid-1650s, Kirby’s Wharf Farm is a 500+ acre working farm situated on the Choptank River south of Trappe. The property features expansive 180˚ views of the Choptank River as well as the town of Cambridge on the opposite shore. Classified as a nature sanctuary, wildlife abounds along the ponds, inlets and hedgerows of the farm. Eastern painted turtles sun themselves by the ponds, shorebirds wade along the marshes and bald eagles soar over the Choptank. The property features numerous barns and agricultural buildings as well as several homes in addition to the manor house. This year a limited number of tickets to the Meet the Artists Party will be marketed to the public in an effort to engage new patrons. These tickets will cost $150. As ever, joining the Friends of Plein Air guarantees entry to the Meet the Artists Party. Plein Air Easton is the work of the nonprofit Avalon Foundation and support is tax deductible. Individual benefits are listed below. * Complementary Collectors' Preview Party tickets cannot be applied to purchase of artwork. ** Signed framed posters are by request only. Contact info@pleinaireaston.com to order. In addition, you will be contacted by Plein Air Easton staff to confirm your use of benefits. Do not hesitate to contact us directly if you have any questions 410-822-7297.